Monona Veterinary Hospital PC - Monona Chamber & Economic Development, Inc. Here at Monona Veterinary Hospital P.C. , we provide complete medical, surgical, and dental services to our patients. Whether you are just starting out with a new furry friend or you're helping a much-loved member of your family grow old with you, we offer services to fit every stage of your pet's life and needs. We are a full service veterinary hospital focused on providing th e highest quality care for our patients. Dr. Chris Jensen and staff are dedicated to keeping your much-loved family member healthy and happy throughout his or her lifetime. We offer comprehensive medical exams, routine and emergency surgical services, dental care, hospitalization, boarding and grooming. We take pleasure in cultivating friendhips with our clients. 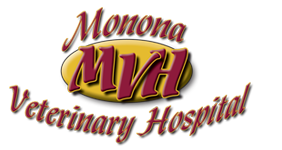 When you visit our clinic, you become part of the Monona Veterinary Hospital family. We provide the same care for your pets as we would expect for ours.